I've wanted chickens for a loooonnnng time. When we first purchased our house in Buckeystown, I knew that one day I'd have enough room for a little flock of egg laying hens to call my own. My husband wasn't as keen on the idea, but after almost 10 years of pestering, joking, pretending to buy chickens without his consent, etc. He finally gave in and said that he would "not say no" to having chickens. Once that door cracked open, I jumped into chicken owning before he could change his mind! While I knew little chicks would be super cute, I wasn't prepared for how adorable they would look being held by my own little chick. 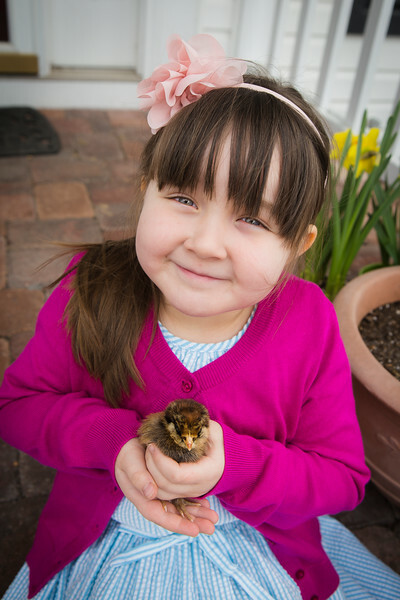 Here is Etta's Easter picture for this year...now excuse me while I go cry.